The camera in the ready room at the Olympic Aquatics Stadium, which captured Lilly King’s Mutombo-like admonishment of a doped-up Russian swimmer on Sunday, was back at it again Monday. As Michael Phelps and South African rival Chad le Clos prepared for the semifinals in the 200-meter butterfly, NBC viewers were treated to a tense shot of le Clos shadowboxing and Phelps sitting silently and, we can only assume, concocting a plan to drown le Clos in the middle of the race. If you didn’t already know that these two swimmers don’t like each other, NBC made sure that changed. Along with the ready-room scene, the cameras captured le Clos staring down Phelps before the race, and commentator Rowdy Gaines seemed moments away from turning into Jim Ross. 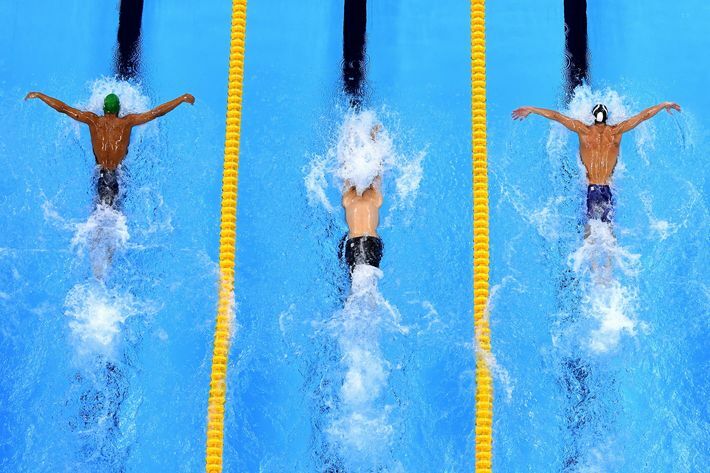 Eventually, the race started and Phelps beat le Clos, but both of them lost to Hungarian Tamas Kenderesi. All three will be back in the pool tonight for the final, an event that Phelps has been looking forward to since le Clos won gold in London. That was the beginning of this rivalry, which has burned off and on in the past 48 months, all of it leading up to tonight’s race. Five hundredths of a second — that’s how much faster le Clos was than Phelps in 2012, giving the South African the gold and Phelps his first international loss in the 200-meter butterfly in a decade. Phelps announced his retirement after London, meaning le Clos would always be the guy who sent the greatest swimmer of all time into a retirement with a loss in his signature race. 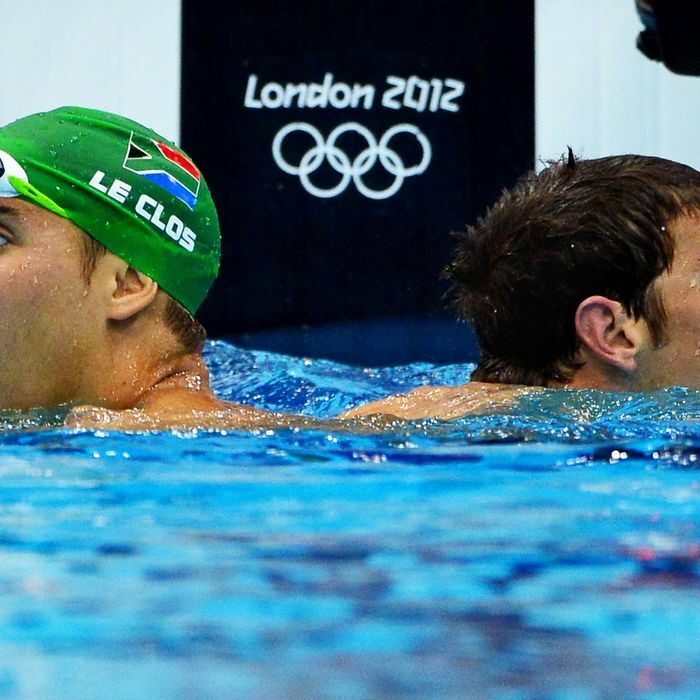 Le Clos continued to let his mouth do the talking. “I’m just very happy that he’s back to his good form, so he can’t come out and say, ‘Oh, I haven’t been training,’ or all that rubbish that he’s been talking,” le Clos said, referencing Phelps’s claims that he didn’t really try in London. Le Clos’s dad even got in on the trash talk. “However fast Michael goes, we go faster. I don’t care about his times, because I know my son is going to beat him,” he told the AP. A few months later, le Clos revealed that the back-and-forth with Phelps hurt him. And then he tried to hurt Phelps. “If I was as great as he was, I would conduct myself in a way children would be proud of,” le Clos said, clearly referencing Phelps’s 2014 DUI arrest and subsequent stint in rehab. “I thought I was good friends with him, clearly not. I don’t think he likes me very much,” he added. That brings us to Monday night, with Phelps snarling like a rottweiler as le Clos danced around the ready room. After the race, in which Phelps beat le Clos by more than a second, he was asked about his rival’s dancing. “He does his thing, I do my thing,” Phelps said. Tonight they’ll each try to do the same thing and embarrass the other in the 200-meter butterfly, which is definitely the second-most-anticipated Olympics event of the night. The first? The scene beforehand in the ready room.